An ostracod, well protected inside a bivalved body. This is the group of animals that is best known for the crabs and lobsters. But they have many microscopic relatives. With the insects they belong to a large group called the arthropods. They all have segmented limbs and a hardened external skeleton made of chitin. Which crustaceans can we find in fresh water? 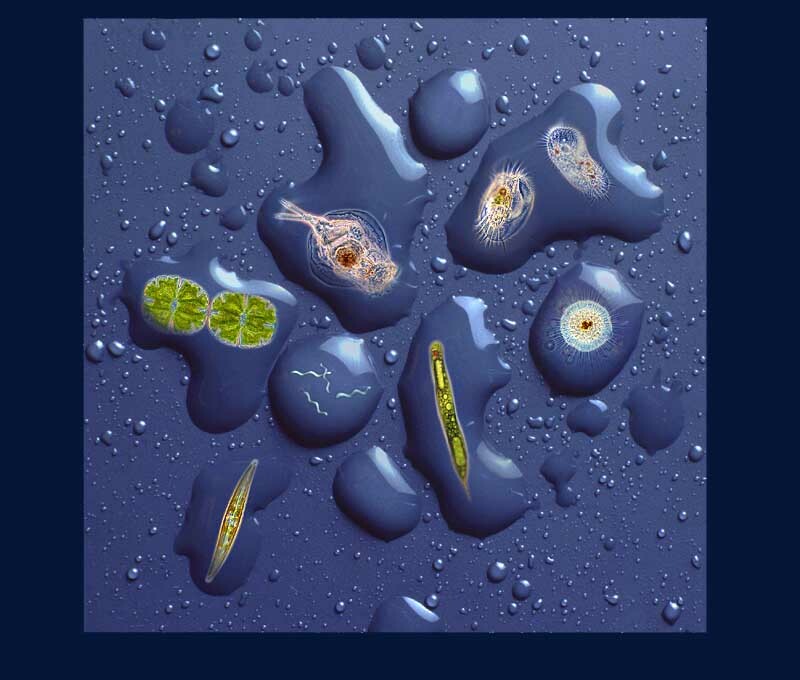 There are three major groups of microscopic crustaceans that you might encounter when you look at a drop of pond water: the water fleas, the ostracods and the copepods. 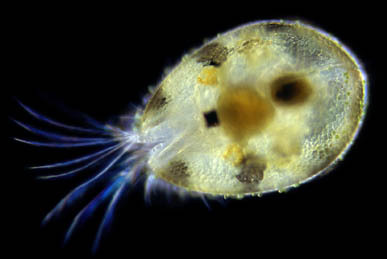 This image of the water flea Daphnia pulex shows its basic body plan. One of the most obvious features are the large antennae. They use them for locomotion. Above the antennae you can see the large eyes. It looks like a single eye but it consists of two compound eyes that are fused together. Inside the bivalved protective shell called the carapace lies a row of five or six pairs of feet they use to filter food (small algae) The food can be seen as the yellow brown substance. Left of the gut, eggs can be seen. Find out much more about waterfleas in the Micscape article Waterflea Anatomy! The little heart is easy to observe when you examine a live specimen under the microscope. You can count the pace of the heart beat with a pencil and a stop watch. Just tap the pencil on a piece of paper following the pace of the water fleas heart during one minute. The ostracods (see top image) are very interesting little crustaceans. Their shell is even more protective than that of the water fleas. They can shut the two halves completely and withdraw themselves in it. Their shells are so strong they fossilize well. Their fossils are very important in the study of ancient earth layers. Prehistoric earth layers can be dated by determining the kind of species that inhabited the layer. 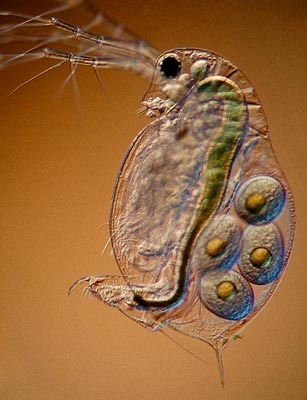 The last group of microscopic crustaceans depicted here is that of the copepods. Their body does not have a shell like appearance but is more slender and segmented. 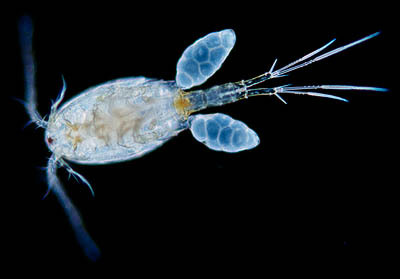 In freshwater they are not as numerous as the water fleas but in the ocean they can be found in astronomical numbers. We may even consider them the most numerous animals on the planet. They are the major food source for fish and even whales. Click the thumbnail to view a detailed illustration of a copepod showing the many specialized limbs. This image shows a well known freshwater form, Cyclops. It is called a Cyclops because of the single eye spot. This female carries two packages of eggs near the base of her tail. Read more in the Micscape article about WATER FLEAS : Portraits of giant and predatory forms, marine water fleas and the development of their young. use the POND LIFE IDENTIFICATION KIT !